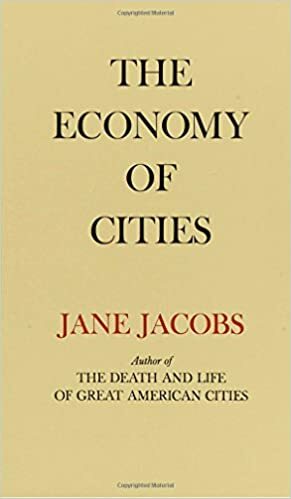 Description (from Amazon) In this book, Jane Jacobs, building on the work of her debut, The Death and Life of Great American Cities, investigates the delicate way cities balance the interplay between the domestic production of goods and the ever-changing tide of imports. Using case studies of developing cities in the ancient, pre-agricultural world, and contemporary cities on the decline, like the financially irresponsible New York City of the mid-sixties, Jacobs identifies the main drivers of urban prosperity and growth, often via counterintuitive and revelatory lessons. My review: 3.5/5 Why did I read this book first published in 1969 in 2018? Because, while preparing the section on the future of a couple of books that I am writing, decided that actually would make sense to retrieve and read material that I saw quoted- and to see it alongside other material on mobility and the development of cities in Europe. Actually, the key concept is useful for the definition of XXI century ecosystems, quite compact, and a fast and entertaining reading. And the thesis of the author, that was unusual back then, actually makes sense when you are seeing "towns" as "separate motivational environments", and therefore the development of "support" structures whose size and existence is possible only if there is enough demand. To bring back to the book: agriculture developed only after towns and villages developed, which is actually the same approach that, in business, I saw since the late 1980s (and in politics, while reviewing documents from Brussels that we received in the early 1980s). Or: it makes sense to have shared, separated services if first you have enough entitities able to use those services, and that therefore see an economy of scale. If you didn't sleep over the last decade, you probably heard more than once that some see as the future of states turning into the future of cities. The author used extensively a fictional case (the development of a community in Turkey as precursor of one that was actually found), to show that not only cities grow, but also can lose abilities that they had before, shrink, and then grow again into something completely different. Which, incidentally, is a known fact of history in Italy, were many important towns in Ancient Rome either disappeared or became irrelevant few centuries after the Fall of the Western Roman Empire- and never got back where they were.